Do your fave jeans that you have had for many years not fit you now? Are they soo baggy that you have to wear a sweater so they do not fall? 🙋. Yup, I have been there too. Lets get to mending! The grading of the stitch I used was 3. It can vary based on your sewing machine. After I made the dart, I tried on the pants to see if the dart would bother me and it does not. So I left it intact. If you feel that the thickness of the dart will bother you, you can cut open the dart, iron it down and zig-zag the edges of the seam. Keep in mind, that if you cut open the dart and if you ever want to make it bigger instead of smaller in the future, you will need to patch the gap. The more aligned your lines look, the less visible your alteration will be. The alteration will be neat and seamless. Exactly as we want it to be! No one will notice you altered your jeans! Wear your jeans inside out. Place your jeans on top of the cutting mat and with your ruler and chalk pencil straighten the two lines into a dart. 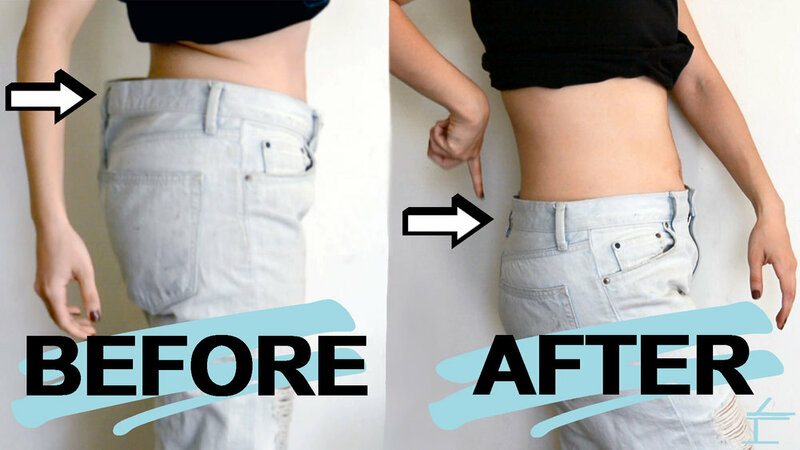 Draw a center line in the middle of the loose waistband, then snip. Caution: You are cutting the loose waistband not the pants. Grab two pins to pin down each side of the waistband. Fold the dart you made and pin. You can use two pins, the most important thing, is that the dart folds well. Sew the dart with a straight stitch. Make sure to remove your pin as you sew. Tip: As you reach the end of your dart, sew straight up. *** OPTION: 7a. If you feel that thee thickness of the dart will bother you, you can cut open the dart, iron it down and zig-zag the edges of the seam. Pin the belt loop and sew in place using a straight stitch. * If you can have someone to draw the line for you, that would be best. The help can make drawing the line easier and more accurate. **The grading of the stitch I used was 3. It can vary based on your sewing machine. ***By doing this, the dart will be flatten.